Everywhere you look these days then there are poker coaches, poker websites and poker books and magazines all discussing no limit hold’em. But yet even as a full time player and writer then I am still not blinded to the fact that this form of poker is probably the most difficult of the lot for novice players to succeed at. In the final part of this series then I want to discuss variance and how this affects your mind set. I often hear how tournament poker has the worst variance out of all of the major forms of poker. I am certainly not going to dispute this as it is a given. However what you also need to factor into the equation is that if you are playing a live event then even if you bust out horribly, you are never going straight back into another event in a negative frame of mind. This is not the case in online cash games where if you get AA busted by KK for 100bb then you just may be multi-tabling and facing several more key decisions within the next few seconds. In fact you may be buying back into the very same table that you have just lost 100bb on. What makes matters even worse is that these beats can come thick and fast online and you can take several very big punches in a very short space of time even though the speed of online play means that you will get into the long term faster. This is not always seen or noticed by novice players in the heat of the moment and is why variance can often be the most formidable enemy that any poker player has to face during their lifetime as a player. In fact many a potential successful player has probably stopped playing the game simply because a really bad run very early in their poker life totally and utterly destroyed their confidence. 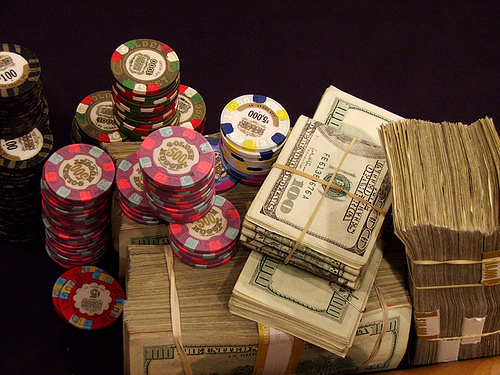 Someone once said that poker was a “tough way to make an easy living” and these words are very prophetic. Poker can be an easy living if you can accept everything that comes with it or it can just be the hardest thing that you have ever tried to do in your life.